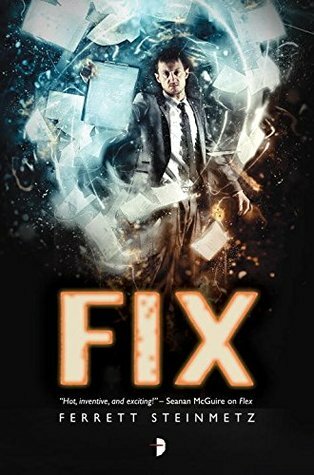 Fix is the conclusion of the ‘Mancer trilogy by Ferrett Steinmetz. I’ve enjoyed the series so far, so the conclusion had rather large shoes to fill. Generally speaking, it manages to match, and in some cases exceed, my rather high expectations. The world of Fix feels a little different to that of Flux, its immediate predecessor. Here we’re slowly seeing the rise of a legitimate front for the issue of rights for ‘Mancers. They’ve spun out of the rather more violent ‘Project Mayhem’ of the previous book, but Paul, his family, Robert, Valentine and the rest of the gang seem to be trying to go legitimate. With the spectre of a broken Europe, torn apart by magical breaches, ahead of them, the US public are sceptical of those using magic, especially when they’re not under government control. But they’re also increasingly willing to believe that those people are deserving of rights and protections. Europe looms large through the text, a boogeyman of chaotic magic, where natural laws may suddenly cease to apply, often without any warning. Government ‘Unimancers’ struggle to contain the devastation, whilst acting as a hive-mind of ‘mancy. The Unimancers have been a faceless force until now, a single-minded horde driven to destroy our protagonists at the behest of a government terrified by uncontrolled ‘mancy. Now they’re still a bit scary, but we’re allowed to see a little further into their space, and look at what drives the Unimancers. Steinmetz has provided a world where magic and mayhem go hand in hand. Where humanity appears to be on a precipice, a world where there are discussions about civil rights, about transhumanism, about government overreach going on forcefully, both in the fore and background of the narrative. It’s fascinating stuff, and it provides a compelling context for our heroes and their actions. The central cast remains the same as the previous volume. We spend some quality time with Paul here, the Bureaumancer who can use paperwork to change the nature of reality. As the narrative begins, he’s struggling to provide a normal-seeming life for his family – his daughter is the world’s youngest ‘mancer, and all of them are on the run from a government which hasn’t exactly hesitated to use lethal force. In hiding, trying to create average lives for themselves, there’s the scent of a storm in the air. The author catches the ionised tang of paranoia and claustrophobia perfectly, as well as evoking perfectly the loneliness that being outside of society entails. Paul is on the outside, looking in to a world he may no longer be part of – and over the course of the text, he’s left questioning himself, his motivations, and whether what he’s attempting to achieve is actually right. The focus of the narrative is really on family, especially the relationship between Paul and his daughter, Aliyah, whom we saw receiving a rather rough and ready education in ‘mancy in the preceding book. Aliyah is fragile in some ways, a person afraid of being who she is, because that person can be a spectacular danger to others. Still, over the course of the text, she is perhaps the one that undergoes the greatest change – looking for her identity, existing outside of her father’s influence and desire to protect her. Aliyah is always a pleasure to read, and now older than she was in the previous book, is grappling with how to live her own life, and decide who she is and who she wants to be. Perhaps unsurprisingly, given her magical talents, this process of discovery is a bit more fraught than it might have been otherwise. This is really a book about family, and what family is to people, and how the bonds of family are structured and stretched. That the family can throw fire, shatter security systems and occasionally play football (‘soccer’) is a bonus. There’s more from Valentine here too, as she tries to help Aalliyah with her self-identification, and struggles with her own relationship with Robert – who, no longer a ‘mancer, is having his own problems. There’s a complex family dynamic going on here, as well as questions of who is family, and how, and what ties them together. The interpersonal relations are done with care and attention, and are incredibly convincing – and emotionally fraught. I have to admit, this dynamic was my favourite part of the last text, and it’s great to see that it’s a core component of this one – and has remained as well done. The characters are flawed, sometimes broken people, but there’s a sense of affection and love permeating the pages as well, and making the whole feel quite painfully real. The plot – well, no spoilers, I think, but let’s just say it makes the stakes of ‘Flux’ look small-time. There’s some absolutely top notch action scenes, which flow nicely and seem to end explosively – and an unflinching examination of the costs of those scenes as well. The book kicks off with a bang, and whilst there are some wonderfully contemplative moments throughout, there’s also a ratcheting tension which drives a need to find out exactly what happens next. The conclusion is explosive, but also carries a narrative veracity which comes from having characters you know and care about, as they put themselves in danger for a cause that they – and the reader – are invested in. Is it worth reading? If you’ve not read the series before, this would probably work as a stand alone, but I’d start at the beginning . If you’re already a reader of the series, you owe it to yourself to pick up the conclusion. It’s thoroughly enjoyable. 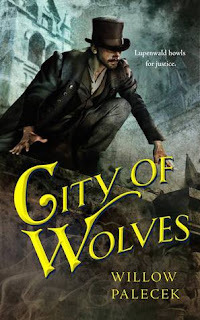 City of Wolves is a novella from Willow Palecek. It follows the wonderfully named Alexander Drake, a private investigator swimming in a sea of vice, iniquity and the occasional smidge of magic. The world of City of Wolves is drawn in carefully minimalist strokes. There’s enough here to engage the reader, and get their mind working, but the prose doesn’t carry any extraneous detail. The narrative occurs in and around Lupenwald, the titular City of Wolves – and it’s a city of several parts. There’s a nobility here, with a sense of class privilege and corruption in place. There’s law enforcement ready to turn a blind eye when crimes impact on their masters. Then there’s dens of vice, where the law, if it does not exactly fear to tread, certainly treads carefully. It’s a city that seems to have stark divides along social lines, but also where money can buy you anything, from bread, to swords, to silence. There’s a sense of a wider political context here too. A civil war has resulted in a reunified, but still fractious kingdom. This leaves a scent of disorder wafting through the air. If the wider world evokes Chandler, the central strand of the narrative has hints of Christie. There’s a coziness of structure, if not of mood, as our protagonist digs into a murder – interviewing witnesses, combing flowerbeds for evidence, and making some rather convincing conclusions. If the world is the backdrop to the murder, this view of a self-centred, fractious nobility in a sprawling country pile too small for all of them – that’s the backdrop to the story. It’s sufficiently well drawn that you’re able to fill in the blanks yourself with familiar elements – but distinct enough to make the world feel unique. The characters get very similar treatment. I would have rather liked to spend more time with all of them, if I’m honest. Drake fills the role of world-weary investigator well, and there’s some hints of his past peppered throughout the dialogue. He’s also clearly a man with a certain type of connections. There’s intelligence on display here too, though perhaps he’s a bit too used to being the smartest person in the room. Still, there’s a life, a heft to Drake, and I’d quite like to spend some more time in his company. The remaining cast don’t fare as well, sadly. There’s a wonderful turn from a police Inspector with a firm dislike of private investigators and an aura of knowing on which side his bread is buttered. But beyond that, there’s a variety of foppish noble scions, none of whom stand out particularly. Don’t get me wrong, they do the job of driving the plot, serving as distractions and suspects – but it would be nice to have the opportunity to see more of them. The plot – well, it’s a nifty murder mystery, with supernatural elements. These are always tricky to pull off, I think. This time it succeeds because the story sticks to its own internal logic for the supernatural elements – and throws in others we’re more familiar with – Holmesian style footprints in the garden, rifle fire from concealed glades, missing items of clothing. It’s all delightfully convoluted, the reality wrapped in red herring after enigma. The conclusion makes sense, and carries a nice sting in the tail as well. As a mystery, it’s entertaining, and the fantasy elements give it a good flavour. Worth reading? If you’re into the fantasy-mystery space, then this may be for you. It’s nice to see this area seeing a bit of a revival; this novella will fit happily alongside the Maradaine Constabulary and Amra Thetys, and serves as a tautly intriguing introduction to characters and a world that I hope to see more of. Of Sand and Malice Made is a prequel of sorts to Bradley Beaulieu’s excellent “Twelve Kings”, which I spoke about last year. 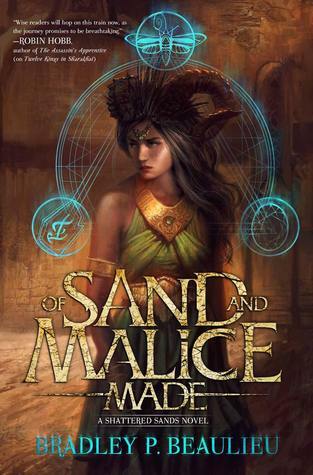 This is a shorter prequel text, composed of three linked novella, but set in the same world, and dealing with many of the same characters – including Ceda, the feisty, wrathful, driven and thoughtful protagonist of Twelve Kings. Here, we can see a younger Ceda. She’s still splitting her time between making a living in fighting pits, and working for a local crime syndicate, but there’s a little more naiveté here, perhaps more mercy, and a kind of gentleness. She’s willing to sacrifice a great deal to achieve her aims, and that may even include herself – but there’s an unwillingness to see others hurt, a less calloused interior life available to the reader. I you’re coming to Ceda for the first time, I suspect she’ll come off as a bit brusque, but sharply intelligent and ferociously loyal. She’s also keenly self aware, exploring and examining her feelings and intensions – not forensically, coldly, but organically, with a weight of emotion lurking behind her self-exploration. She’s prepared to be violent, and often forced to be so – and sometimes, the seething anger between the words breaks loose, and she is even glad to be so. Ceda is, even here, somewhat isolated, cautious, but filled with a roiling bucket of emotion, a mixture of loneliness, rage, ties to her friends, and a desire for those friends, for affection and companionship. In short, she’s a rather complex, difficult person – but marvellously plausible, and, in her complexity and humanity, a thoroughly enjoyable protagonist to follow. She’s backed up by some returning characters from Twelve Kings. I won’t give any spoilers, but would say that they serve as interesting bulwarks of support, letting us see both a little of themselves, and a little of Ceda in the way each relates to her. The villain though, is something else. Implacable, and thoroughly, intentionally inhuman. A creature of cold, and of warped purpose, acting in the way it is made – causing torment, with a bubbling malevolence, and a casual arrogance, a sense of age and ownership which seeps off the page. Beaulieu has created a monster here, something that approximates and imitates humanity, but fits into athe disturbing uncanny valley, and simply feels wrong – whilst also itself being plausible, a thing with thoughts and desires of its own, and an agenda – that it has for sure. The world – well, it’s largely the city of Sharakai, and points beyond. This is a city with a flavour of heat, sand whirling in the distance, a heat-haze sliding slowly into view. It’s a metropolis, urban, bursting with people between bowed trees under a harsh sun, and a harsher rule. But there’s magic here too, sparkling in the oasis of Sharakhai, Oaths of power, and curses read yo to warp the minds of men, or to rot the flesh off their bones. Between the sandy, grit-blown city streets sits the fantastic, at the liminal edge of our understanding – and that of the characters. The magic is deep, and often deadly, but it’s a fact of life in the city, and in the dark hollows of the desert sands outside of it. There’s some time spent in the desert too, and the sense of quiet desolation is palpable. This is a world of boundaries, the spaces between, which cross those boundaries – and the people that populate those spaces. It’s a paradox, a barren land swarming vividly with life – and entirely believable because of it. The plot – well, I won’t give spoilers. Each of the novella can be read independently, but they link together chronologically into a coherent story. There’s great pacing here – I picked up the book and found myself unable to put it down. Ceda is always mivung quickly, working against time to try and fulfil her goals – or at least frustrate others. At heart, this is a story about a relationship, but that relationship is surrounded by broken temples to mysterious gods, by sword fights with magical monstrosities, by slow, creeping evil, and sparks of a thoroughly human heroism. In any event, it’s great stuff – highly entertaining, with compelling characters in an intriguing world. Pick up a copy – you won’t regret it. 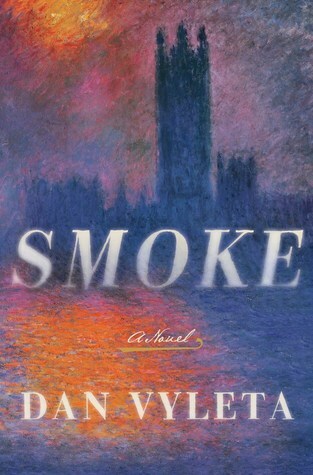 Smoke is a new fantasy novel by Dan Vyleta. It’s set in a world with certain similarities to the Britain of the Victorian era; however, in this world, a user’s aggressive or negative thoughts and actions are made visible, through the medium of the mysterious ‘Smoke’. The world consciously evokes Dickensian literary heritage. There’s pastoral green hills, lined with the arrogant offspring of the nobility. There’s small towns, filled with vice and danger, traps for the unwary. And then there’s London, a hive of scum and villainy, wreathed in smoke – and in Smoke. This substance both displays an individual’s lack of moral fibre, and encourages it – as a physical manifestation of darker impulses, when breathed in, it can heighten those impulses. This means that a society is in place in which the nobility rule with a visible moral rectitude – after years of training in finishing schools, they are at least nominally, sufficient paragons of virtue that they do not Smoke. This validates their control of the country – when the urban factory workers and fieldhands, struggling with their own visible small evils, see a man walk through them with a white shirt, unmarked by sin – then they have no intellectual space to argue against divine right, or over oppression. Sections of the book take place in one of the finishing schools for noble sons, and the prose here is reminiscent of Thomas Hughes, with a harder edge. There’s ritual here, the comforting traditions of day to day life. There’s also casual brutality, entitlement, and a well concocted feeling of conformance to the social order. In other words, this is a school for scions, and privilege permeates the very air, seeping off the page at the reader. Overall, this is a closed Britain, one with a quiet system of oppression, and a firmly inward, self-referential focus. It’s well (and chillingly) drawn, whilst remaining familiar – with fascinating differences. The characters are something else again. We follow, in the main, two unlikely friends. One is seemingly quiet, reserved, even withdrawn – a measure of perfection in a world where Smoke is always a danger to one’s social standing. He’s also friendly, and eminently likable – and a perfect foil to his friend. The latter struggles with a complex home life, and a difficult emotional legacy – sitting atop a carefully constrained fountain of rage, always on the edge of letting it loose. Vyleta shows us a boy becoming a man – or perhaps a monster, it’s hard to say. Watching his fears as the black anger rises up internally, the feeling of release in violence and despair is a kind of joy, tinged with concern. Vyleta has given us an excellent portrayal of a duo bonded together by happenstance, but magnetically drawn together. In their petty guilts, unwise risk taking, in their innocence and the loss of it, they are heartbreakingly familiar, and cunningly crafted protagonists – and thoroughly entertaining. The plot begins as a standard schoolboy yarn, of sorts, a tale of little triumphs, victories in the schoolyard, the agony of defeat in teenage antagonisms. But it gradually broadens the field, leaving the school behind for the houses of the wealthy and their politics, and the raw dangers of larger cities. There’s a slow burn on this one, a sense of impending avalanche as our heroes chase their way across the country, torn between a broader conspiracy and the intimate dangers following them from their school. There’s social commentary here, and a smidgen of wonderfully awkward romance. There’s world-changing science and some wonderful moral moments mixed in as well. Is it worth reading? I think so. It’s very original, taking a small change and running with it to create a vivid, fully formed world, with well developed players and a plot which, if sometimes rather slow, is very compelling. Definitely worth a look. This book is many things at once: a character study, a journey novel, a post apocalyptic adventure. The last of these is probably the best place to start. The text is set in an America a generation after a Night of the Living Dead-style event; Cities are shattered. Government is non-existent. Hordes of the dead are roaming the earth in a cannibalistic frenzy. Uninfected survivors are holed up in fortified enclaves, or travelling (carefully) between them. The setting is familiar, the timing less so - the portrayal of younger characters who have known nothing but this shattered world is well done, and the older characters memories of a kinder world are delicately dropped into the context around them - emphasising the state of the remnants in which they now find themselves. However, this is not Resident Evil style novel, full of characters lurching from one danger to another, constantly in danger of being devoured. Rather than making the infected threat explicit, they are typically used as background, to ground the actions of characters in this new world. While the rise of the infected has created a new form of society, they are shown in the text more as a fact of life (like hurricanes, or flash floods), an unreasoning force which must be dealt with, rather than a vibrant, close range threat. This is not a novel where the heroic female protagonist saves the earth from a zombie horde, or even escapes from it. The time period forces us into a new mould, where the characters must integrate the reality of infected into their lives, and societies. In another way, this text is a journey novel. Specifically, it follows the travels of a young woman named Temple, as she attempts to escape a pursuer with murder in mind. Whilst the pursuit itself is interesting and tense enough, the real colour here comes from the characters and situations that Temple encounters as she travels across this more desolate America. Rich survivors, holed up in a compound with electric fences and dark secrets, bizarre mutants, a fortified train...each is marvellously portrayed, and helps draw the reader into this unique world. Rather than "World War Z", the text puts me in mind of Steinbeck, particularly "The Grapes of Wrath", and "Of Mice and Men". It isn't plot driven per se, but sets out to show the reader a world, and the characters and ways of life embedded within that world. The journey is clever, the settings excellent; the characters are believable, and, to some degree, disturbing. In each case, they are very well portrayed. Finally, this can be seen as a character piece, a study of the interactions between Temple, a girl who is never entirely sure who she is, and her companions and nemeses. I won't go into detail here, for fear of spoiling the plot, but will say that Temple's struggles with her past are excellent, her actions and reactions drawn from a central character which is consistently and marvellously portrayed. The text is written in her voice, laconic, sharp, effective - a narrative which, in its structure, emphasises the character it surrounds. To summarise, this is an excellent book. 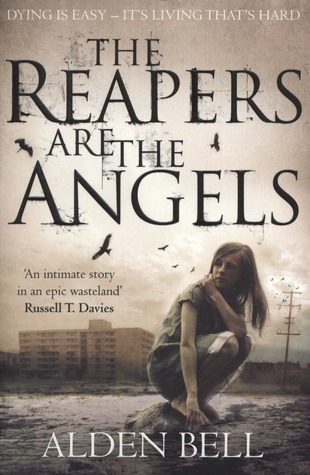 A character study where the characters are believable, if perhaps not always sympathetic, a journey novel where the travel - both internal and external - and setting are excellently portrayed; a post apocalyptic adventure with enough zombies for anybody - though perhaps not occupying the same position in the text as they do in books like "I Am Legend". This book sets out to do a great many things, and does them all well. I was drawn in and wrung out by it, and enjoyed it immensely. Well worth it. 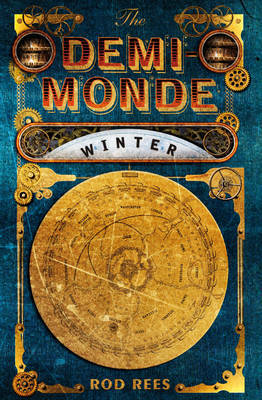 The Demi-Monde: Winter is a text which is defined by its setting. Fortunately, that setting is quite clever. If you read the back of the book (or the `Back of book' text on Amazon) and were put off, you might want to give it another look. I'm glad I did. Essentially, the Demi-Monde of the text is a virtual simulation, constructed and populated by the military, with 30 million virtual people (or `Dupes'), and architected to simulate a perpetual state of war, through population pressure, resource scarcity, political extremism and various other factors; the most notable of these is the `seeding' of the setting with several high-functioning `dictator' personalities, which have risen to control their respective areas of the Demi-Monde simulation. Essentially, the Demi-Monde is a simulated hell, populated by millions of suffering normal individuals, and led by the worst minds of human history. However, something has gone wrong; the means of entry into this virtual world have been locked down. The few soldiers inside captured and used unspeakably, unable to wake up and return to reality; and somehow, the US President's daughter has wandered inside, and disappeared. The protagonist is a female jazz singer, selected by necessity, who is sent to retrieve this missing daughter and get them both out of the Demi-Monde. Oddly enough, I didn't come to the text expecting much; the idea of a virtual world ruled by psychopaths seemed a little off-the wall, a pastiche version of Tad Williams `Otherland'. The conceit of the President's daughter being lost gave it something of a `24' feel - it sounded, really, a little silly. But somehow, it works. The protagonist is well written, given strong views and a forceful personality, but not imbued with any special talents. Her motives are convincing, and internal dialogue consistent. The supporting cast, both real and `dupes' are equally well done. Many of them are deeply unpleasant people, as befits the setting, and they act that way - though usually with some self-justifying pragmatism. Interestingly, the reader finds themselves invested in the `dupe' characters, despite the fact that they aren't real, at about the same rate as the protagonist. By the end of the text, each of the characters is `real', and we care about their fates, even though we are told that they are simple simulations. Interestingly, several of the characters maintain fairly solid personae through the text, but others develop in interesting, unexpected, and appropriate ways. The plotting is excellent; laced with twists, turns, and unexpected circumstances. The fast-paced prose gives it the feel of a thriller, and the well-drawn series of events makes it a good one. Perhaps my only complaint is the overuse of capitalisation in the middle of Dem-Monde concepts (for example, one of the dominant political creeds is UnFunDamentalism). A few of these make up amusing puns, but after a while, I just wanted to get through a page without any capitalisation - still this is a minor niggle. Overall, the central conceit is interesting, with enough variations on the familiar `virtual world' theme to make it unique. The world itself is intriguing, the characters well drawn, the dialogue snappy and the plot fast and furious, making for an excellent debut. The Demi Monde does not disappoint. 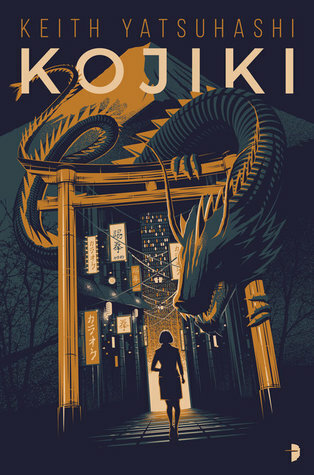 Kojiki is the first in a new series by Keith Yatsuhashi. It suggests a world in which some of the older forces of Japanese legend, the kami and associated myths, are real – some of them sitting behind the scenes in our modern day. They struggle to control a disaster they unleashed on the world, one which could destroy everything if it broke free. As the text opens, that disaster is straining to be unleashed. The world is our own, familiar in many ways. Modern Tokyo seethes with activity, and the cap of Mount Fuji towers in the popular imagination. People live and work, and in some cases, go on historical tours. The author shows us a land filled with people similar to the reader, just going about their day to day lives. It’s drawn broadly, but with sufficient style that I was able to picture it vividly. Alongside this mostly familiar geography, however, sits one entirely separate. There exist manifestations of elements – air, water spirit, earth, fire – who were once involved in a titanic struggle, which broke the world, and reshaped it into its current form. They live in a space of concept and memory, drawing disciples to them, in a half-world, a liminal space intersecting only marginally with what we think of as real. There are castles in the air, delicate battlements drifting in a breeze. A sturdy rock guardian, shaping and breaking the earth when required. Serried ranks of samurai-disciples, ready to fight and die for their elemental ruler. There’s some wonderfully imaginative set pieces here – volcanic fires, devastated cities, the struggle between elemental s played out against a backdrop of modernity. I would have liked to have delved deeper into the half-world (though there are some rather hefty infodumps throughout) – we see some of how the current situation was created in flashbacks, but there’s a rich mine of mythos here to be excavated – perhaps later books will put it on display. The characters suffer a little against their backdrops. We’re given a protagonist who enters this strange world of the supernatural at the same time as the reader, and her acclimatisation to this world goes hand in hand with our own. But whilst we’re sat alongside her, I never quite felt that I got to know Keiko. She’s smart, cautious, and occasionally funny. But what drives her to excel, what gives her passion and informs the decisions she makes? This is alluded to gently, over the course of the text, but it needed to be looked at in more depth, I think, some meat put over the bones of the character. She’s perfectly readable, but never quite feels real. The same is true of several of the kami. They seem defined by their elements, and have character traits on display, but we can’t get at the details that define them. Some of this is resolved in flashbacks, again, but glimpses of the past don’t give the characters as a whole enough heft. The exception is the nominal villain, the fire lord – a tormented figure, driven to madness, and defined by love. Here is a complex, well drawn antagonist, one moment a beast, the next displaying noble motives and a mind like a steel trap. His journey, and resolution, bring the characters up considerably – they’re defined in their interctions with what they oppose, and why, and it feels like this struggling, tragic figure is the lynchpin of the narrative. The plot – well, it starts with a bang, It felt a little confusing in the early stages, as we followed our protagonist in being drenched with information and context, trying to get up to speed. There’s a slow burn happening after a frantic start, but once ti gets going, it’s easy to become invested in the battles between dragons, the fire and ice, the shadow warriors crawling out of woodwork, and so on. There’s a stutter between the slower segments and the rapid-fire action – but the latter is very well done, and the former work well enough as well. Certainly by the end I was flippinmg apges to see what happened, and that’s never a bad thing. It has the florid style mixed with the gently personal touch of a good manga. If you’re in the mood for a unique spin on fantasy, a space where dragons and elementals war with each other over broken Tokyo – then this book is worth your time. 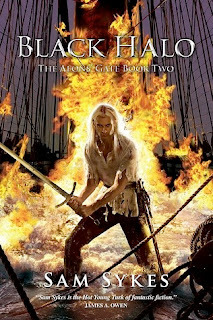 Black Halo is the second in Sam Syke’s ‘Aeons Gate’ series. It’s got a serious amount of action n kicking off, but there’s also some character development there – less openly, but over the narrative course of the text. Anyway, something the author does well is shape his environment – horrifying as it may be. The transitions between paradise and hellscape are delicately, convincingly done, the reader’s perceptions following the characters. There’s a sense of remoteness, and a sense of place – where the story takes place feels real. The characters remain as diverse and broadly unlikable as ever. One of the perpetual surprises of this series is that the adventurers don’t simply turn on each other in a swift bloodbath. In part this is due to the outside pressures they encounter, which keep them facing outward rather than inward with their penchant for violence – but there’s also some interesting group dynamics at work. I particularly enjoyed the burgeoning but problematic romance between Lenk and Kataria – the latter being part of a species that wants nothing more than the total annihilation of the ‘disease’ that is humanity. It makes for some awkward conversations, mostly with one trying not to murder the other. In amongst the backdrop of seething dislike, this is actually a really strong character piece. There’s characters in a crisis of faith, desperately trying to shape their value system. The aforementioned semi-murderous cross-species romance. A dragonman working out what it means to be the last of his kind, and whether it’s better or worse to just kill people instead. Villains with philosophical outlooks on freedom, choice nd the mentality of humanity which demand atrocious actions. In short, it’s good stuff. The plot – well, it’s actually rather slow for some time, a gradual buildup akin to boiling a frog in a pot. That said, the buildup is interesting, with a slowly growing sense of dread – and some genuinely exciting set-piece moments between character building. The conclusion is legitimately excellent, tying together the existing strands of narrative to create a convincing crescendo. Is it worth looking at? Well, it’s a solid follow up to the earlier Tome of the Undergates. The pacing felt uneven to me, and the characters often actively unlikable – but the setting was convincing, and those characters, if difficult to like, were certainly believable. The plot is a slow burn which pays off – so I’d say it’s worth approaching if you’re already invested in the series. Otherwise, try the first book in the sequence.